The struggles for women’s empowerment and improving sanitation are both harmed by using patriarchal messages to encourage construction of toilets. In our empirical research on sanitation and health in rural India, we have become used to seeing patriarchal messages to promote the construction of toilets. Slogans like “Bahu betiyan bahar na jayein, Ghar mein hi shauchalay banvayein” [“Daughters and Daughters-in-law shouldn’t go outside, build a toilet inside your house”] are now painted across walls and toilets in rural India. Through these slogans, men are encouraged to build a toilet not because it will prevent the spread of disease and germs, but because their patriarchal values should not allow women to go outside the house. Further, the idea of ghoonghat, or keeping women covered, is used in behaviour change messages in rural Rajasthan. 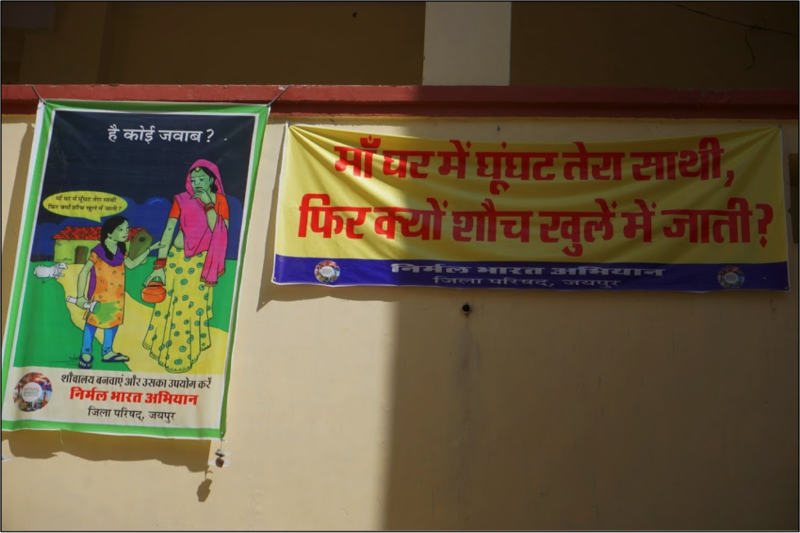 In large banners and in yearly calendars, in government offices and on village walls, the Rajasthan government uses a picture of a woman carrying a lota filled with water. In the poster, the woman is being asked by her daughter, “Maa, ghar mein ghoonghat tera saathi, fir kyun shuach khule mein jaati” [“Mother, when you cover your head inside the house, how come you go in the open to defecate”]. The poster and the slogan use patriarchal logic to point out the inconsistency between practicing ghoonghat and defecating in the open. In the process, this message associates the use of toilets with women, endorses the practice of ghoonghat, and encourages the idea that the right place for a women are the char-diwari of the ghar (four walls of the house). First we had “no toilet, no bride“, now you need a toilet to be elected in India. At least that’s what chief minister Nitish Kumar is proposing for his state Bihar. He made the announcement on World Toilet Day, 19 November. Candidates who don’t have a toilet in their home will not be allowed to contest rural (panchayat) and urban local body elections in the state. The chief minister said he would ensure that relevant legislation (Bihar Panchayati Raj Act) would be amended to make this possible. During the Great Depression in the 1930s, the US Government launched a series of economic programmes collectively known as the New Deal. The largest of these programmes, run by WPA, the Works Progress Administration (renamed in 1939 as the Work Projects Administration), employed millions of unemployed people to carry out public works projects. Most famous was the WPA Federal Art Project (FAP) that employed musicians, artists, writers, actors and directors in large arts, drama, media, and literacy projects. The FAP created over 200,000 separate works including 2,000 posters. 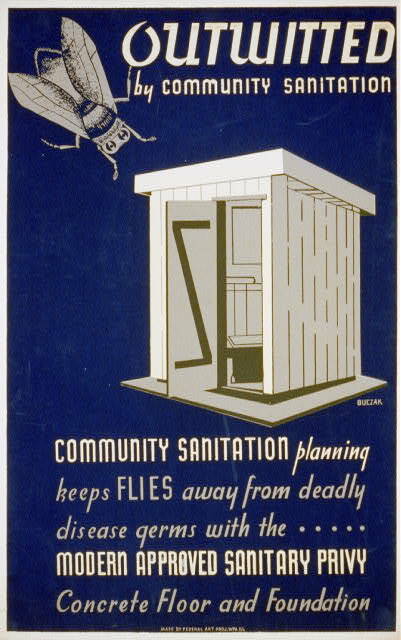 Shown here are several posters promoting sanitation and hygiene from the WPA poster collection of the Library of Congress. In a cabinet reshuffle Rural Development Minister Jairam Ramesh has been stripped of his additional post as Minister of State for Drinking Water and Sanitation . His successor is Bharatsin Madhavsinh Solanki, a former railway minister and a Member of Parliament representing Gujarat’s Anand district. News agency PTI reported that sources in Ramesh’s office were disappointed that their Minister was being replaced . The Minister has been passionate about sanitation-related issues which he brought it in the limelight, they said, adding that Ramesh also managed to get additional funds to carry out the projects. Wherever the Need has produced a simple, but effective sanitation promotion video narrated by Baroness Glenys Kinnock. Wherever the Need is a small UK-based charity with projects in India, Kenya and Sierra Leone. Their latest activity is the introduction of income-generating ecosan toilets in rural Tamil Nadu, India. The state government is providing 50% subsidy for each ecosan toilet. 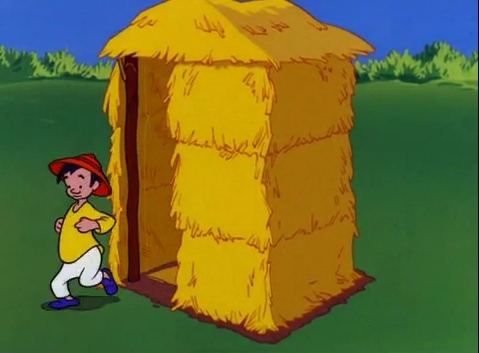 In the 1940s, the Walt Disney Studios produced a series of educational films on sanitation and hygiene promotion for developing countries. The films, in the Health for the Americas series, were aimed at Latin America. They were commissioned by the now defunct Office of the Coordinator of Inter-American Affairs (CIAA), which was later renamed Office of Inter-American Affairs (OIAA). In Nepal, reducing the time it takes to fetch water by just one hour could increase girls’ school enrollment by 30%. While women’s lives around the world have improved dramatically, gaps remain in many areas, including water and sanitation. For example, a recent study in 44 developing countries found that women carry water more often than men by a ration of nearly 2 to 1. Time is but one cost. There are many. How can we draw more attention to gender issues in water and sanitation ? Perhaps through drawings. 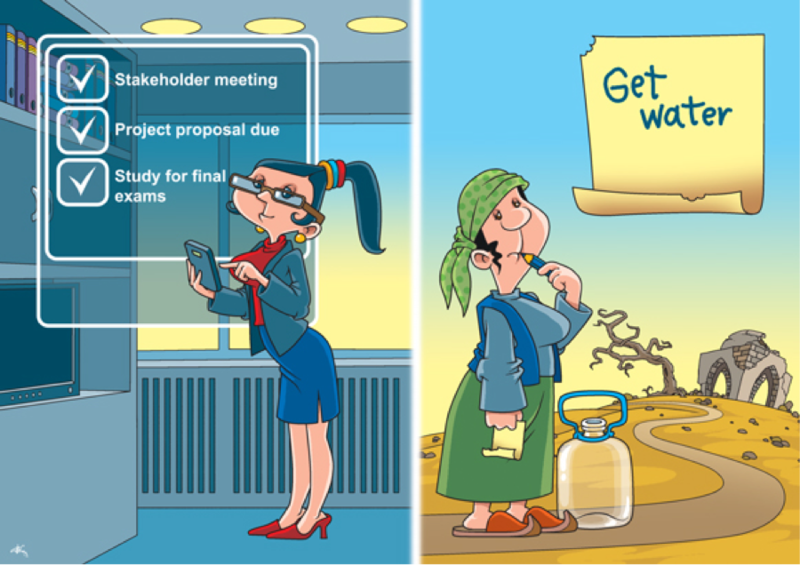 The World Bank/WSP 2012 Calendar combines illustrations, humor, and data to focus attention on the role of gender in developing countries’ ability to ensure improved water and sanitation services for all citizens. Gender is also the focus of the World Bank’s 2012 World Development Report on Gender Equality and Development . Take a look. Images are worth a thousand words– and they can speak on behalf of billions. Comments and feedback on the calendar are welcome at wsp@worldbank.org.